The Stilbaai marine protected area provides protection to a variety of marine and estuarine habitats, including a large sandy bay to the east, smaller rocky bays to the west and the Goukou river mouth, which contributes to the recovery of depleted fish populations and other endemic threatened species. This MPA includes the entire Goukou estuary and is one of the few MPAs in South Africa that provides protection for both estuarine and marine habitats. 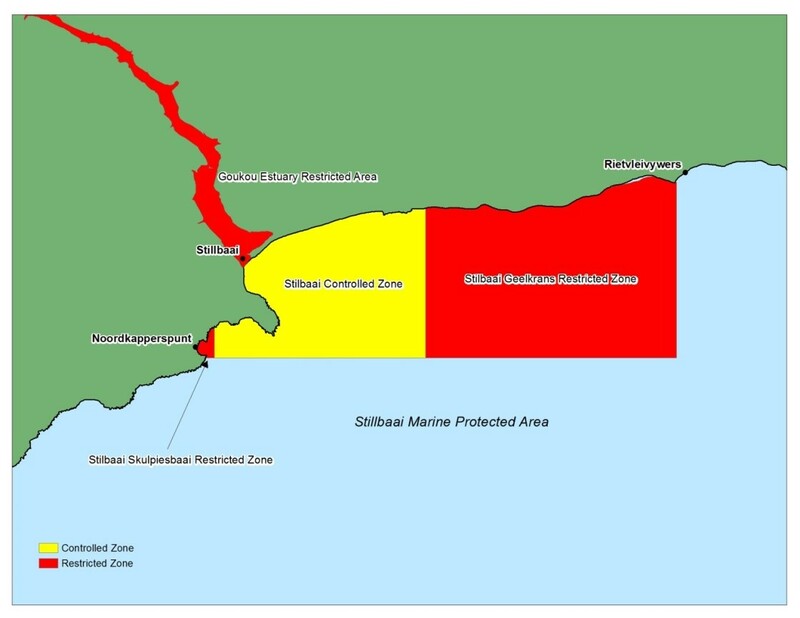 The Stilbaai MPA prohibits fishing and bait collection in approximately 75% of the Goukou estuary and 20 square kilometres of ocean in the Skulpiesbaai restricted zone (No Take) in the west and the larger Geelkrans restricted zone in the east. The MPA also has stone fish traps (visvywers) that provide living evidence of how the early original coastal communities fished the area. Stilbaai’s proclaimed harbour is dependent on having access to the sea and estuary which is used by commercial and recreational boaters. Stilbaai was declared a marine protected area in 2008. It connects to the land-based Geelkrans Nature Reserve, which ensures that the coastal zone is well protected. The area, managed by CapeNature, is protected to rebuild overexploited marine life, particularly reef/line fish. It also protects marine habitats and preserves the stone fish traps, which are archaeologically and culturally important. Fishing is still allowed in the controlled areas of the MPA, but it is banned in Geelkrans, Skulpiesbaai and the Goukou estuary. Goukou was the first estuary to be included in marine protected area in the Western Cape. The Stilbaai MPA is a bio diverse area, with a variety of coastal habitats, including dunes, sandy beach, rocky shore, coastal fynbos, salt-marshes, reefs and estuarine reeds. These habitats are monitored through various projects by CapeNature who is the Management authority. Reserve not open to public from Tourism perspective.